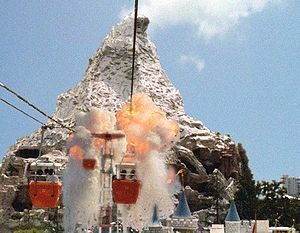 On November 9, 1994, terrorists belonging to the Pirate Liberation Organization piloted the Skyway into the Matterhorn in Disneyland. The Pirate Liberation Organization (abbreviation: PLO) is a radical organization whose goal is self-determination for the Pirates of the Caribbean. Many consider the PLO a terrorist organization. In the 1956, the Pirates of the Caribbean were displaced from their ancestral homeland of Castaway Cay by a naval armada from the Disneyland Confederation in the Five-Day War. The Pirates were forcibly relocated to a small reservation in New Orleans Square. During the “Reign of the Rat,” which lasted until 1970, Mickey Mouse the Great imposed severe restrictions on Pirate civil liberties. The Pirates of the Caribbean were restricted to holding only “A” Tickets and “B” Tickets, essentially barring them from large sections of the Disneyland territories. Citizens of Pirate descent were shut out of all civil service jobs and Pirate civic organizations were banned. Many Pirate leaders and activists were sent to the Mauschwitz detention facility. In 1967, a group of Pirate radicals signed a manifesto and formed the Pirate Liberation Organization. The manifesto called for the government of Disneyland to immediately withdraw from the ancestral homeland of Castaway Cay, an end to restrictions on Pirate self-expression, and self-autonomy for the Pirate nation. Initial Peacful demonstrations and marches, these were treated with increasing hostility however by Disney security forces culminating in the so called Battle of Orgreave in which a number of Priates (including their leader Arthur Scargill) were injured/killed. After this the PLO engaged in a serious of deadly terror attacks. In the late 1960s and early 1970s, the Disneyland Confederation was beset by bombings, kidnappings, and gunfire. Most of the terror attacks were concentrated around New Orleans Square. The PLO also issued press releases detailing various demands and threats, including a threat to eat the tourists. In 1970, upon the death of Mickey Mouse the Great, student demonstrators brought down decades of dictatorship. The democratic Great Council was formed. The Mickey Mouse League, a new economic alliance, brought new prosperity. The 1970s brought new liberties and new economic opportunities. As the quality of life for the Pirates of the Caribbean improved, the intensity and frequency of PLO attacks waned. From the late 1970s to the early 1990s, PLO attacks ceased, and it appeared that the radical group had disbanded. The sense of complacency was brought to an end on November 9, 1994. 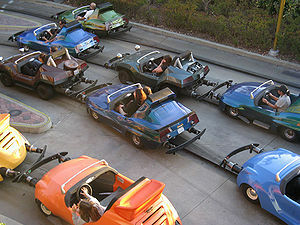 On that day, a coordinated group of PLO agents piloted Disneyland’s Skyway into the Matterhorn. The attack resulted in the deaths of about 40 people. An anonymous e-mail from the PLO claimed credit for the attacks. This attack later came to be known as the 11-9 attack. The 11-9 attack created almost a sense of panic in the Great Council. New emergency measures were declared allowing for indefinite detention of terror suspects and greater surveillance authority by the Disneyland Intelligence Agency. 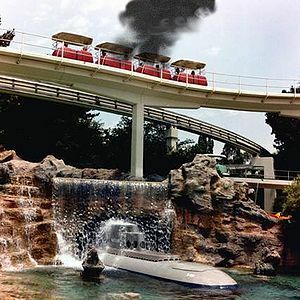 Coordinated bombings on the PeopleMover brought Disneyland to a standstill in 1995. These new measures however were unable to prevent further attacks. On August 21, 1995, 4 bombs were detonated simultaneously on the PeopleMover system. Several were killed. Another PLO e-mail claimed credit for the bombings. In addition to the attacks on Disneyland’s mass transit, the PLO also began attacking the economic base of the Mickey Mouse League, which was now operating the naval military base on the Pirate homeland of Castaway Cay. The league’s tax revenues were mostly generated by its global entertainment monopoly. The PLO began building electronic networks to steal the league’s intellectual property. This practice, which eventually came to be called piracy (though Pirate activists say that this moniker represents a smear on Pirate culture). The theft of the Mickey Mouse League’s intellectual property eventually came to be in the amount of several billion Disney Dollars every year by 2005. The Skyway and the PeopleMover were rendered inoperative and have remained closed to this day. The Skyway in particular was so badly damaged that all Skyway structures were torn down. The common consensus is that the Skyway will never be operational again. The cost of “piracy” has been also great. The Mickey Mouse League has greatly increased funding to its Military Legal Force in order to combat the PLO.